March is National Social Work Month and an important time to recognize and express appreciation for the social workers who are central to our Quality of Life Teams. 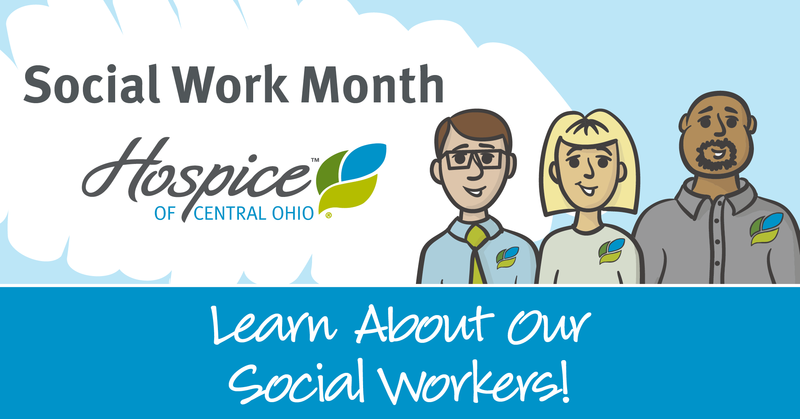 Hospice of Central Ohio social workers help patients and families address the practical and emotional issues that come with serious illness. They help families connect with valuable community resources, including meals on wheels, in-home caregiver support and financial assistance. They educate and inform family caregivers so they feel confident in caring for their loved one. They help patient and family openly discuss their fears and concerns. They help smooth the way when patients need to transition from one living environment to another. They serve as advocates for patients, helping to identify and plan so patients can achieve their end-of-life goals. They assist with completing advance directives and funeral planning. They help assure that children receive the services and support they need when facing the loss of a loved one. Social workers bring knowledge and expertise in working with ethnic, cultural, and economic diversity. They are familiar with navigating the complexities of health care systems. They understand bereavement and are focused on enhancing quality of life and well-being for patients and families. While accomplishing all these things, social workers also provide emotional support and understanding as families face the most difficult challenge of saying goodbye. We are grateful for the role our social workers play in providing superior care and superior services in the communities where we have the privilege of serving.